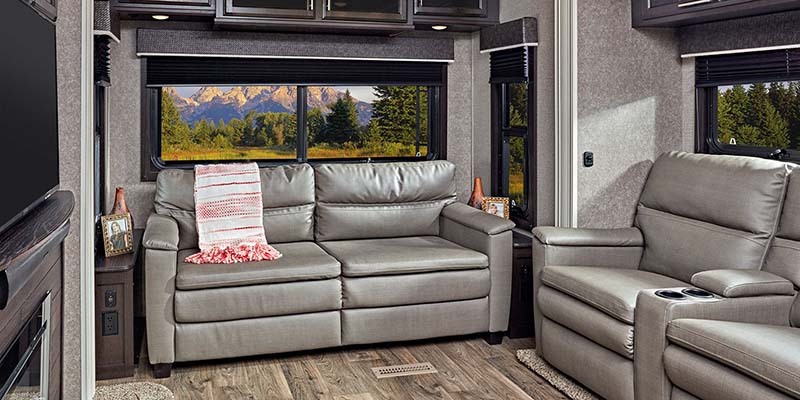 This huge, rear tri-fold hide-a-bed sofa is equipped with a residential sleep surface – and features hidden storage below. 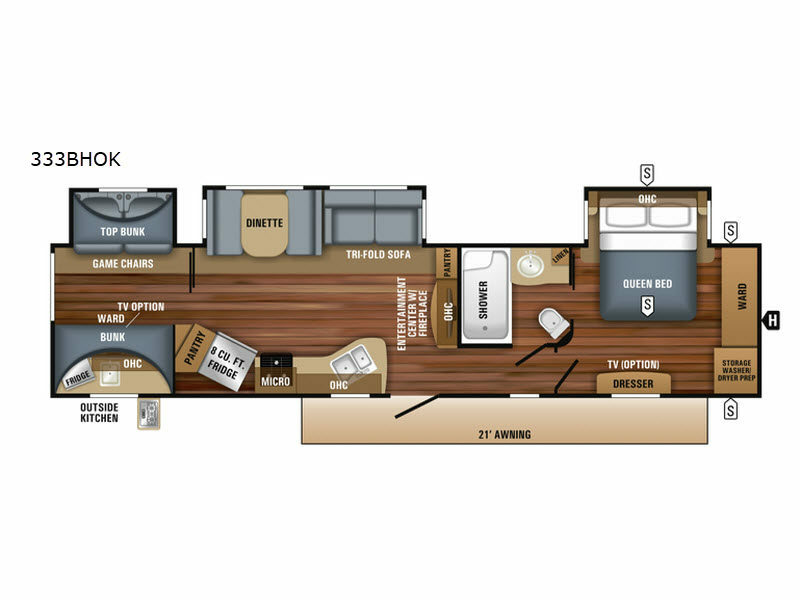 Dual outlets and USB ports on either side of the bed provide convenience to any visiting guests. 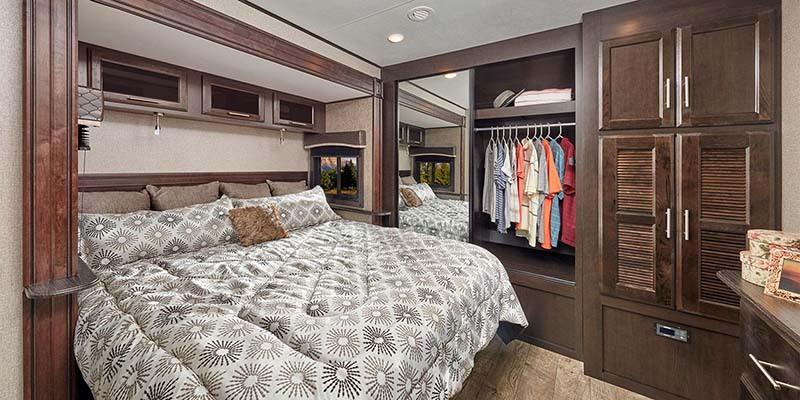 In addition to the standard residential queen Simmons® mattress in the bedroom, every Eagle features a tri-fold hide-a-bed sofa that easily tucks away to maximize living space. 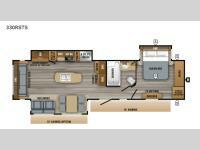 The all-new for 2019 Modern Farmhouse interior design, with antiqued Farmhouse White woodwork, rustic hardware and contrasting accents, beautifully accepts the natural light that pours into Eagle’s many windows. 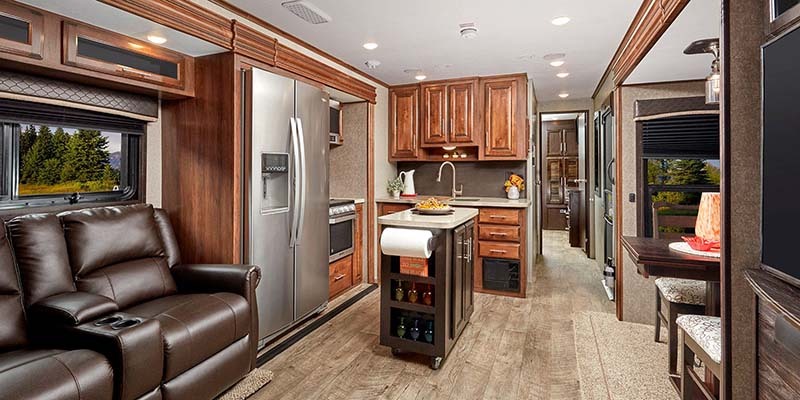 In addition to bountiful storage and beautiful woodwork, Eagle’s kitchen includes a stainless steel OTR microwave, range with glass cover, deep sink with pull-out sprayer faucet and a roll-up strainer with bamboo cutting board. 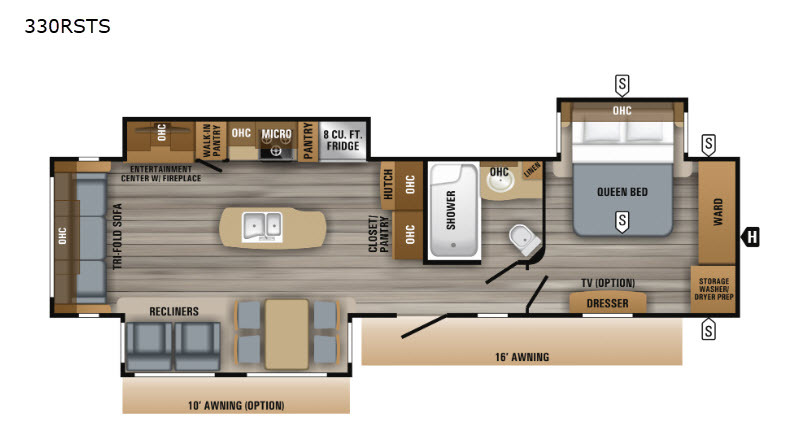 Available on the 322RLOK and 338RETS floorplans, the rolling island pantry is an extra-convenient option that adds even more functional space to the Eagle luxury travel trailer. Huge garden windows in the dining area and spacious views out the rear create wonderful opportunities to let the outside in. 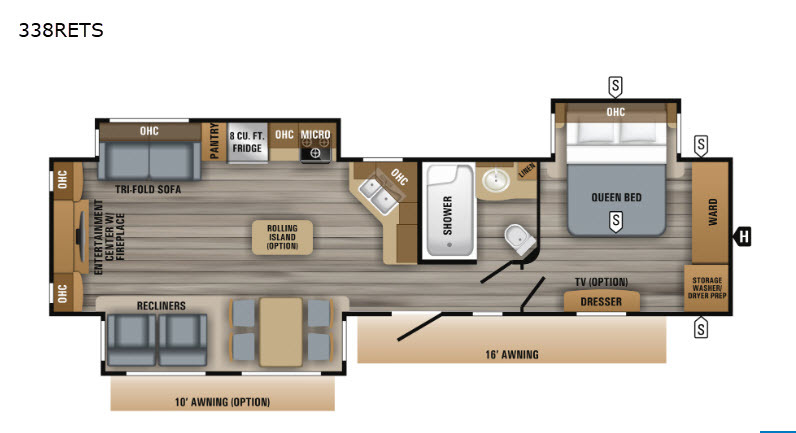 Wall-hugger theater seating across from the 50” HDTV adds to the already-exceptional Eagle luxury travel trailer experience. 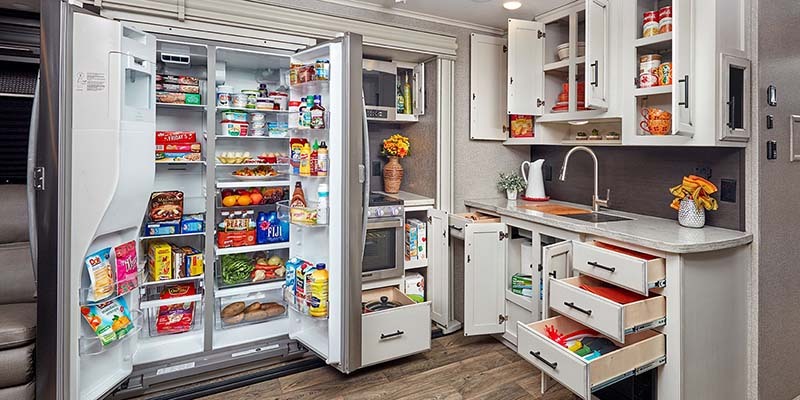 The optional rolling island pantry and residential fridge offer even further storage solutions. 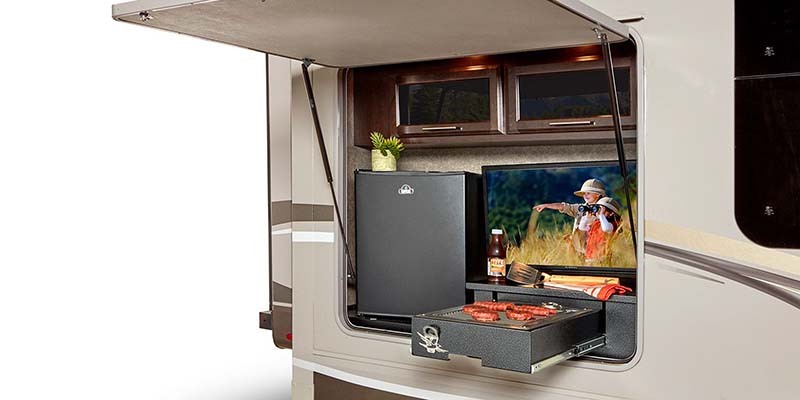 The “industry’s best” outdoor kitchen, with refrigerator, overhead storage, Jayco-logo bottle opener, and hybrid cooktop grill, is also available with optional 32-inch LED TV for an upgraded campsite experience. Eagle is available with a 13-cubic-foot gas/electric or 21-cubic-foot residential refrigerator with 1,200-watt pure sine wave inverter. 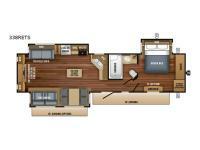 Kitchens also feature solid-surface countertops, soft-close drawers, and USB charging ports. 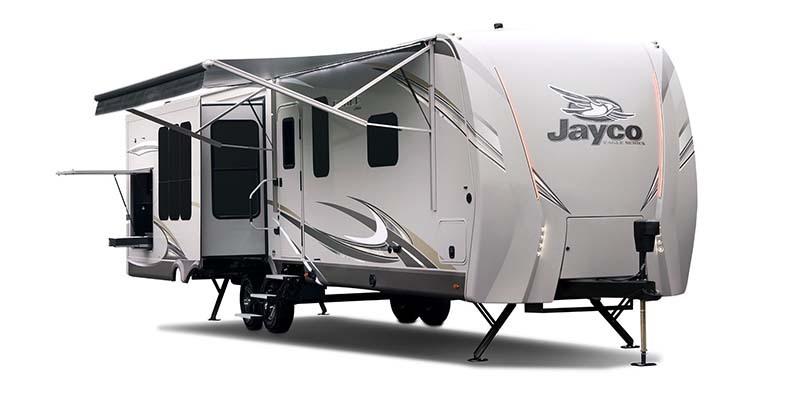 Eagle’s American Tradition décor option is the beautiful creation of Jayco’s in-house interior design team. 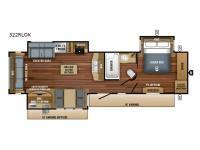 Carefully chosen rustic fixtures, detailed styling, and warm hand-glazed maple tones make the Eagle feel like home. 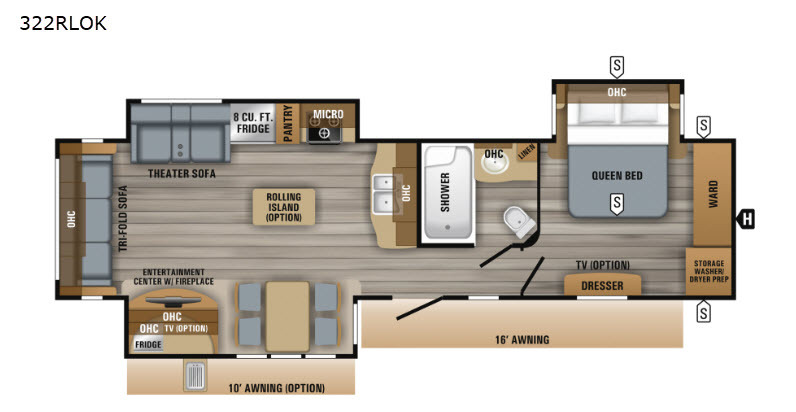 Eagle master bedrooms offer the option for a king-size Simmons® BeautyRest® mattress and come standard with a residential quilted bedspread and pillows, smart LED reading/night lights, and a large front wardrobe with washer/dryer prep. 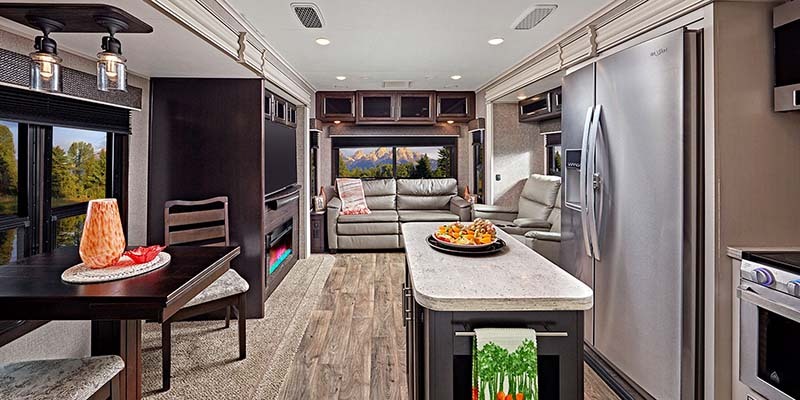 Sturdy, American-made anti-slip aluminum entrance steps with LED light, an electric patio awning with integrated LED lights, and optional electric leveling help make the Eagle luxury travel trailer the ideal choice for campsite fun. Eagle bathrooms feature a porcelain foot-flush toilet, stone and glass tile backsplash, skylight, huge walk-in shower, and exclusive EZ Breeze™ vent. The luxurious medicine cabinet is LED-backlit with custom framing.